Facebook has introduced Paper, a mobile app that mixes content from a user's own feed with articles from "well-known publications" and displays it all with a new interface. The app will first be available for Apple's iPhone in the U.S. on Feb. 3, Facebook said on Thursday. The first section in Paper is made up of a user's Facebook News Feed, where the user can see photos, videos, and longer written posts. Additionally, users can customize the app by choosing among more than a dozen other sections, including photography, sports, food, science and design. Each will include a mix of content from "emerging voices and well-known publications," Facebook said. The basic user interface consists of a top half of the screen, which displays one post or story with an image, and a second section below, where a number of smaller thumbnails are displayed. Users can then swipe to view more content and tap to see it in detail. Images and videos can be showed in full-screen mode. The interface has been built from the ground up for touch devices. Users can, for example, tilt their phone to show different parts of a high-resolution panoramic photo from corner to corner, and see faces and other important details up close, according to Facebook. Paper is the first product from Facebook Creative Labs, which is working on "new apps to support the diverse ways people want to connect and share," Facebook said. For Facebook the app represents the start of a new mobile push, an area where it hasn't always been successful. 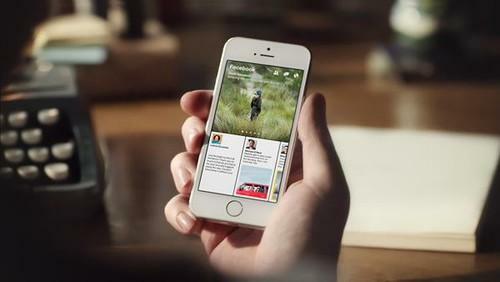 The app will compete with the likes of Flipboard. For an early look, users can visit the app's website.